Hey! Hugh! Get Off’a McCloud! This issue opens with an anecdote that also proves to be the issue’s title…then shifting to our group of strangers in an aircraft, heading for a cloud that the strange woman from the first issue disappeared to. They reflect on the events of the previous issue (in a page-ish on-panel/page recap). They then come up with a plan for compensating for screwed up sensors in Dave using his yellow flame to fly, and manually guide them. The group finds an entire island in the sky, surrounded by the cloud! After a rough landing, the group is captured, and eventually are able to communicate with the inhabitants of the island (after a battle that threatens the airworthiness of the island), and seem to have more questions then they started with. The leader of the island’s inhabitants suggests that "searching for the reason IS the reason" regarding their seeking how they all got these powers, and so on. 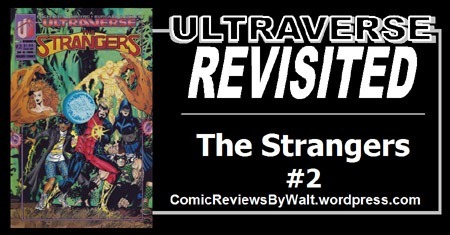 As he "assigns" the woman–Yrial–to the team and sends them on their way, they determine they’ll call themselves what they started out as: The Strangers! Meanwhile, we get some token development regarding a likely soon-to-be villain. This issue (as I’m likely to be saying about many, many Ultraverse issues in the coming weeks/months) is "VERY ’90s" in tone. It’s got what–especially by contemporary comics–is a choppy story with rather quick and convenient plot points (and plot jumps), with some familiar tropes. We have a bunch of people who don’t know each other but suddenly got powers working together–some token disagreement, but conveniently working well together. We have a random flying island manned by a group that knows way more than our heroes, but won’t clue them in, saying they’ve gotta find the information themselves. And we have a group assembled and an additional person arbitrarily added to the group that must be accepted…for the heckuvit. And we still don’t really have any answers, just a slightly wider world that now not only includes a bunch of people hit by lightning developing super powers, but an ancient people with a flying island over the United States and the US Government apparently doesn’t know/hasn’t done anything about it. Story-wise, this works…I’m not completely enamored with the title as of this second issue, but it’s still early; and I’m much more familiar with the likes of Prime and Mantra, with the Strangers as a blind spot…so while I’m eager to get back to familiar stuff, this is new for me. It’s "only" the second issue, and we have a superhero team starting to work with each other, coming together…so it’s going to be continued development. I don’t believe I’d known prior that Yrial was "assigned" against her own choice to participate in the team…I must have thought she was "just another" of the people on the cable car. Visually this is a solid issue. It "looks" like a ’90s comic, and I could do without some of the layouts…but at least the main double-page splash of the group suddenly coming to the island is something that arguably serves the story–showing the sheer enormity of the island, adding to its spectacle as something floating over Los Angeles. This is a colorful comic, not least of which is thanks to Dave and his multiple colored flames and extended "yellow flame" learning-to-fly sequence. No huge complaints or anything for this issue. 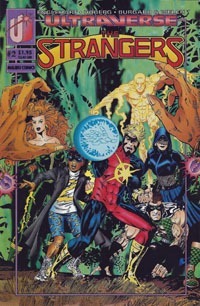 Given what I do know of the Strangers, I would not recommend this issue completely stand-alone. It works well as a 2nd issue…but especially as ONLY the 2nd issue, I can’t think of any reasonable reason to seek this out in isolation on its own without the first issue; and ideally along with the first and next issue to be a bigger chunk of overall story. That said, I’d definitely consider this a bargain bin comic, and wouldn’t recommend paying more than $1 if it can be helped; and ideally 25-50 cents. I’m curious to see the further development of this group of characters, though not as much as I am in Prime or Mantra. Given those were two of my favorite Ultraverse books as they came out, that I mostly kept up with, I recognize my bias even as I can’t honestly or with proper authenticity rid myself of it. Those were my favorite titles, so delving back in, I want to get back to what I enjoyed…forcing myself to read other titles is–while starting out–forcing myself to read other titles I haven’t read and don’t have a singular interest in. This isn’t a bad issue, but it hasn’t immediately become a favorite for me or anything like that.